To Pick or Not to Pick? Litter's the Question. 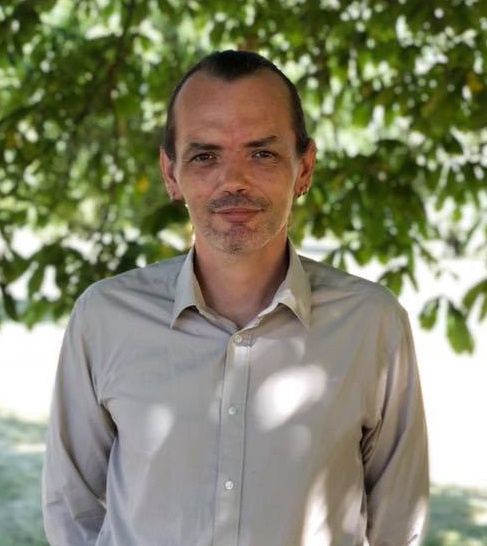 Several times lately, I've written about the negative impact that fly tipped rubbish and littering has on our communities and our environment. Everything I've said has been negative. That's no surprise. All fly tip is bad, isn't it? Yesterday, a conversation on a local Facebook group gave me pause. Do you know what? I know exactly what he means. building a den and searching for hidden treasures. I grew up in the '70s. There was only one TV in the house and your weren't allowed to watch it without mum and dad's permission. There was no web, no video games, no mobile phones. If you were lucky you might persuade your younger sibling to play a board game with you to alleviate your boredom. As a result I, like generations of kids before me, spent most of my childhood outdoors, messing about in the dirt. I climbed trees, dug holes and rooted about in undergrowth for hidden treasures. The treasure I looked for wasn't money or contraband. It was marbles, toy cars, playing cards. Anything like that would be an excellent find. Conkers might as well have been gold nuggets when I was at school. If you found a good horse chestnut tree, you'd be down there after school to raid it, regardless of whose garden it stood in. I don't know whether I should share the next bit... I grew up in an army town. There were often military operations in the local woods. As kids, we'd play in those woods. No one ever stopped us! We'd find bullet casings throughout the undergrowth. We'd take them home to play with and our parents never batted an eyelid! There was also a different attitude to 'dirt' in the '70s. 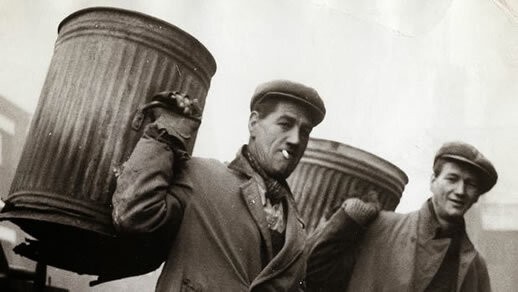 Back then, dustmen (they were always men) would take absolutely everything left out. It was normal to see these burly chaps carrying rolled-up carpets and unwanted chests of drawers on their backs (health and safety wasn't a concern). Sometimes, they would take what they collected home with them. The phrase 'Just leave it out for the dustman' was often heard. My best friend's dad worked on the bins. My friend collected badges, and her dad would bring a fresh hoard home to her every day. It was great! People used to leave all manner of stuff on the streets for the dustmen to take and if you got to it first you helped yourself! Planks of wood, broken buckets and old wheelbarrows were terrific 'finds' for us kids as you could use these to build you den. 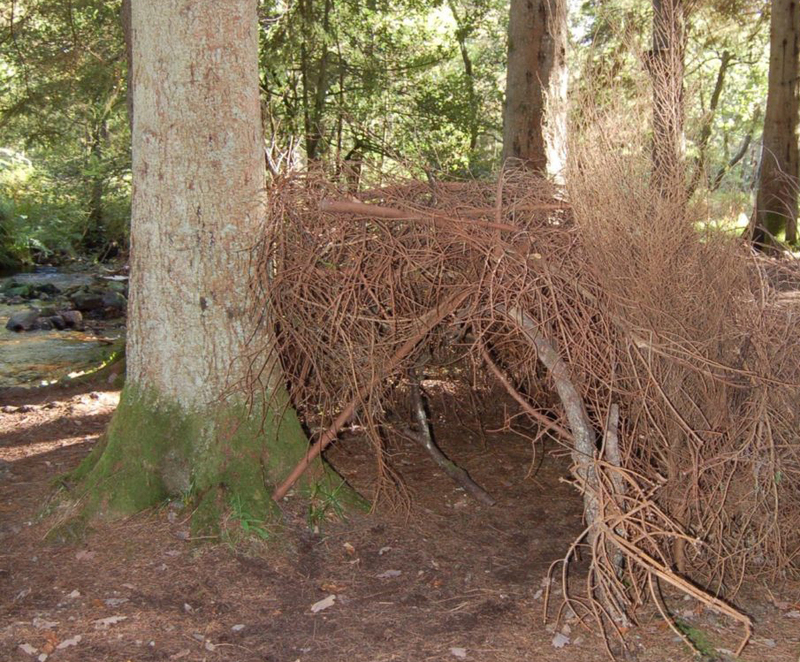 And dens were really important in the '70s, because if you had a sibling the chances were you had to share a bedroom with them and had little space to call your own. When you built a den in the woods you had somewhere to be with other kids your age, away from your younger brother or sister. I spent a lot of time in dens, chatting to my mates and playing conkers. As an adult, I miss the smell of the earth and I miss getting dirty in it. So I get it. I understand why it's great for kids to be in the fresh air, foraging around for interesting objects to play with. I also understand that without a bit of risk in their lives kids don't learn how to be safe. My childhood looked a bit like this. But we no longer live in the 1970s, alas. The one BIG development that has changed all of this, possibly forever, has been the sudden ubiquity of plastics in our environment. Plastics, and other non-biodegradable materials, are not as much use for den-building and, if left in our environment, cause nothing but problems for our communities and our wildlife. Little can grow under plastics and small animals and birds can become trapped in them, or ingest them, and perish. It isn't just that plastics exist, it's the way we use them and our attitudes towards them that cause the problems that we now face. There's just too much plastic in our lives. Plastic is too cheap. It comes to our shores from the Far East via colossal container ships. That didn't happen in the '70s. And in the '70s we didn't have fast food the way we have it today. Fast food means packaging and much of that packaging, a lot of which is plastic, ends up in bushes all over Orton. We should know, we pick it up on our litter picks. 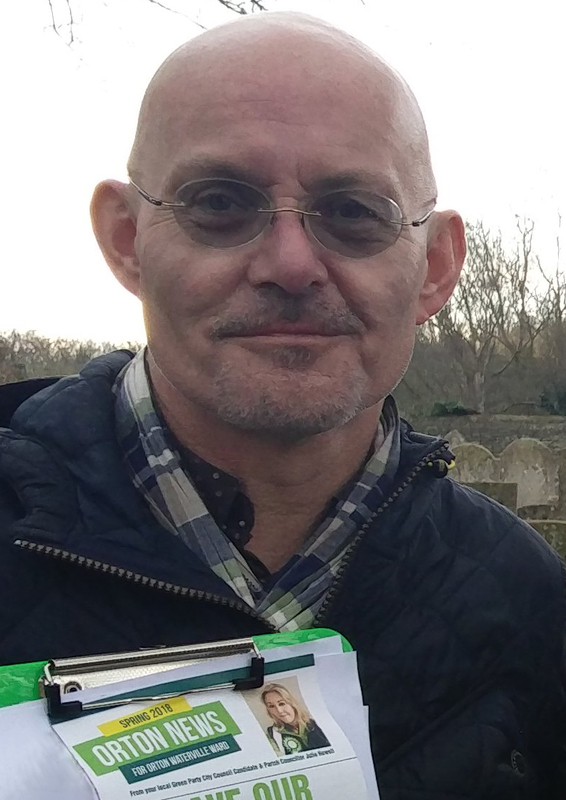 The vast majority of rubbish that Peterborough Green Party picks up from the streets, verges and playing fields of Orton is plastic bottles, crisp packets and sweet wrappers. This stuff isn't much use for dens, and most of it has human or other organic matter on it that you wouldn't want your kids to be touching (we don't touch it ourselves, we wear gloves and use sticks to pick it up). Forty years ago, the odd mattress dumped in a field didn't cause too many problems. If they could get to it the dustmen would probably take it away on their next weekly collection. But, anyway, people threw out less in the decades immediately following the second world war. Rationing had made people value their possessions more. The 'throw away' culture didn't exist. When the 1980s arrived, higher standards of living and new manufacturing processes which heralded the mass production of plastics meant 'make do and mend' was out and 'disposable' was in. To its credit, the city council has responded by giving us the means to recycle much of our household plastics. However, it doesn't do enough to meet the challenge of fly tipping, which has now reached epidemic proportions. Mattresses habitually dumped today are not removed unless someone reports them to the council, which may not have the resources to collect it any time soon. In the meantime, the mattress will attract other fly tipped waste and, before you know it, you've got both an eyesore and an environmental hazard at the end of your street. In a few short decades, we've regressed from children happily scavenging for buried treasure to play areas blighted by discarded plastics and other waste that is no use to anyone unless it is disposed of safely and responsibly by the council. We Won't Destroy Your Dens! Returning to the point made on Facebook, that all our wombling around Orton is spoiling kids' fun. Sadly (or happily, depending on your perspective), the council and volunteer litter pickers will never be able to remove all the litter and fly tip from our streets at the rate that it is appearing there now. Any area we clear looks just a bad a week later. The council is unlikely to get on top of our littering and fly tipping until we all change our habits and stop dropping it on our streets. And while residents, very understandably, complain about the hassle of getting things to the recycling centre, if we broke the cycle of buying cheap plastic products only to throw them away a year or less later, the problem of fly tipping might not be as bad as it is today. On the subject of dens, please don't worry. 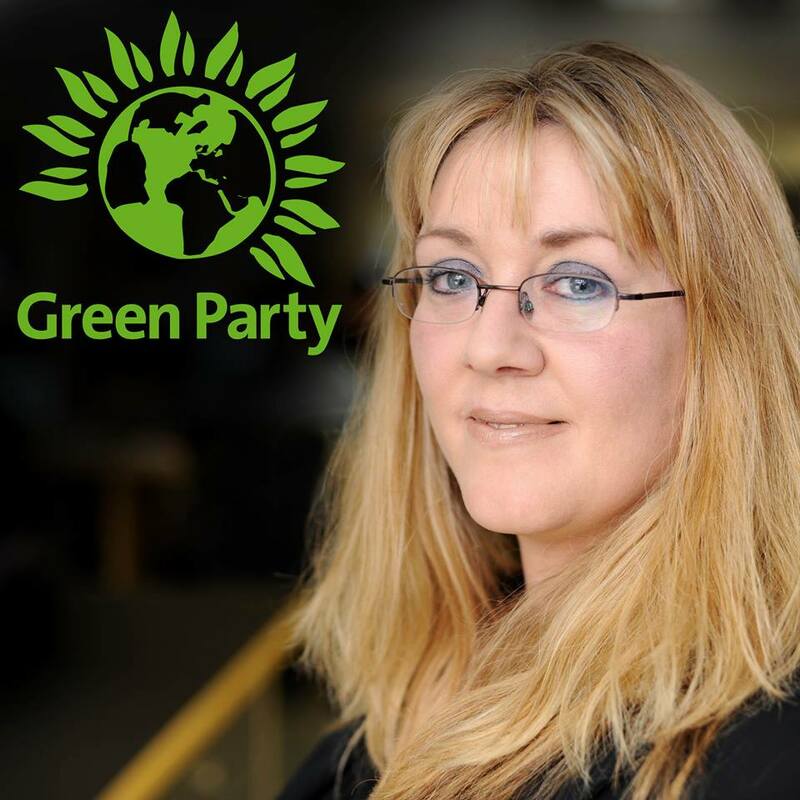 Peterborough Green Party will never destroy a child's den. We love that children play outside and we love that they still use their imaginations to use what they find to make new things. This is great and we wholeheartedly encourage it. But we don't want our children to have to sift through dirty, harmful plastics to find their buried treasure, so please join us in keeping Orton free of plastic littering and harmful fly tipping. You can report fly tip you come across on 01733 747474 and why not join us on our next litter pick. Details here. 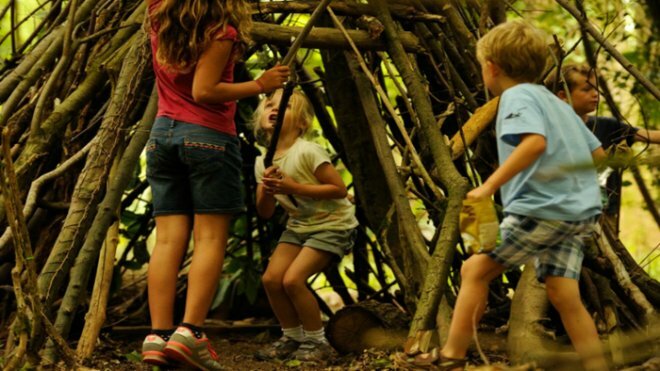 Building a den is one of the many joys of childhood.